Stock screening processes are the HOW of turning your investing strategies into reality. KISS 101 was created to illustrate the steps in this transformation. If you are not familiar with WHAT the strategy requires, check here. For the August 1, 2017 go-live, strategy screens were created using three different products - Stock Rover Basic, Portfolio123, and MorningStar Premium. Each has unique capabilities and illustrate some of the decisions required to build the screens and portfolios. Stock Rover Basic (the free version) is sufficient for a basic strategy like KISS 101 which only uses single factor ranking. Once the create screen form is open, name the screen (e.g., KISS 101) and enter a description of WHAT is being done, as well as when the screen refresh event and the health check will occur. 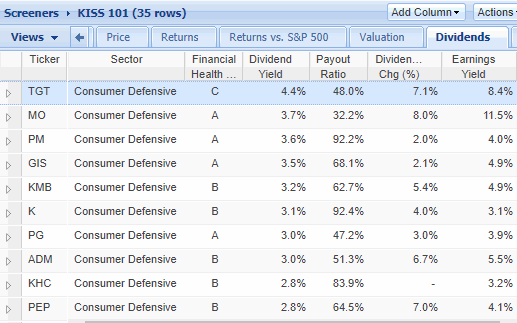 Find S&P 500 companies in the Consumer Defensive (Staples) sector and manually select the 5 top (ranked by yield) stocks. Payout ratio must be <100. Refresh every 3 months for 1st trading day in Aug, Nov, Feb and May. A health check is performed the other months for the 1st trading day of the month. 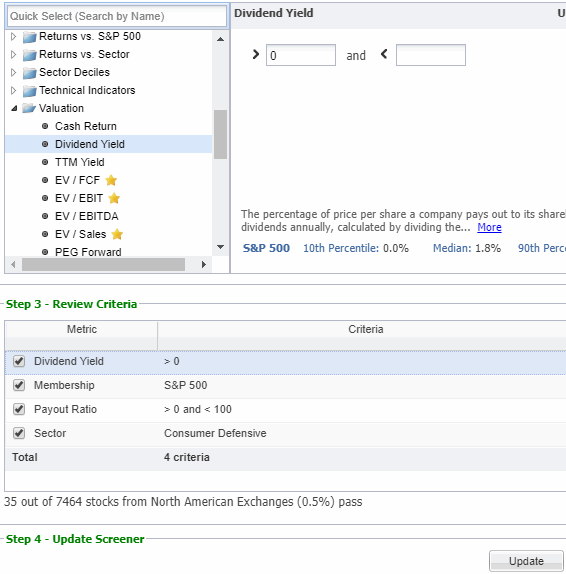 From the "Profile" criteria, select Membership and use Edit to specify the S&P 500. Next, select Sector and then select "Consumer Defensive" (aka Staples) from the dropdown list in Edit. From the "Valuation" criteria select Dividend Yield and set "> 0". See below. From the "Cash Flow Statement" select Payout Ratio and set "> 0 and < 100". Now that the screen is built, clicking the "Update" button saves the screen and identifies the passing companies. Any additional criteria that may be useful at the review step should be included in the view. Here, the MorningStar financial health grade, the 1 year % change in dividend, and the earnings yield are included. Download this point-in-time data for passing stocks to a spreadsheet - it will not be available on StockRover in the future. The preferred way to run a health check is to screen the portfolio. In StockRover Premium this is possible. But not in StockRover Basic. In Basic, run the screen again to confirm that the 5 stocks in the portfolio still pass the buy screen. 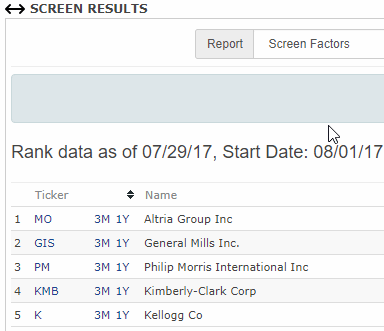 If a stock does not pass the screen, replace it with the highest ranked stock not already held. Do not convert the portfolio to the 5 top-ranked stocks. That happens on the 3 month refresh, not on the health check. To run the health check in Premium, run the buy screen against the portfolio and confirm all stocks in the portfolio pass the screen. If 1 or more stocks do not pass the screen, run the buy screen against all stocks to identify the highest ranked stocks for replacements. In Premium, running the screen against the portfolio is a right mouse function when hovering over the screen name. Update the portfolio with any changes. NOTE: There is no need for a health check in a month when the refresh is run. Stocks held are placed in the Portfolio provided by StockRover. This allows some analysis of the portfolio and weekly and monthly updates of performance. As stocks are sold and replaced, update the portfolio. You can simply list 1 share of each stock or the actual shares held. Or, whatever works best for you. Significant detail is available about each stock in the available panels. There is no independent portfolio associated with the screener. But since historical data is available, a ticker list of current holdings works like the portfolios in other products. Portfolio123's screener provides several tabs to enter description, criteria and rules. Enter the description in the About tab and save the strategy by name. 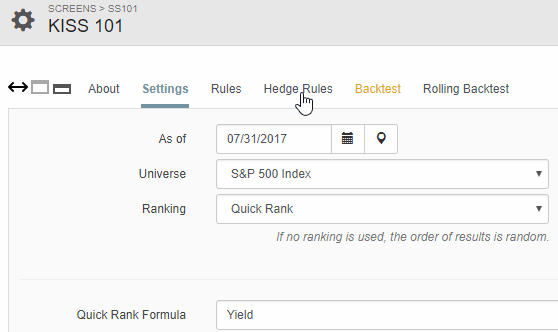 Then specify the S&P 500 universe as shown in the Settings tab. Notice that it is possible to rank the passing companies within the screener. Yield has been specified as the ranking criteria. The number of top-ranked companies to select is set to 5 on this tab (not shown). Also, notice that the date of the screen can be set. This allows you to examine the passing companies and the associated data at any point in time starting from 1/1/1998. If a market timing system is used that can be defined in Portfolio123, it is set up in the Hedge Rules. For KISS 101, an external system is being used. The Rules tab specifies the remaining rules and criteria. The Consumer Staples sector is specified. Yield must exceed 0 and PayRatio for the trailing 12 months (TTM) must be less than 100. Notice that equations are used. Equations are also available in StockRover Premium but not in Basic. They offer much more flexability. Also notice that it is possible to add a comment (the text after //) to document the rule. One further difference between Portfolio123 and StockRover is the data source. Portfolio123 uses CompuStat and StockRover uses Reuters. This will result in some differences in the passing companies. For example, Reuters Consumer Defensive includes Target (TGT); Compustat Consumer Staples does not. Clicking on the Run Screen button (not shown) generates the list of the 5 top-ranked companies passing the screen. As much or as little data that interests you can be shown. The tickers for the top-ranked companies can be saved in a custom ticker list to parallel the concept of a screen-able portfolio. It is not necessary to download the data (although you can) since the screen results for this date will be available at any time in the future. In addition, after reviewing the performance of the strategy, you can try different screening criteria and back-test to examine the performance. No need to track all the options you are considering for a strategy. Remember that back-testing was used to refine the stock screening criteria used in KISS 101. Stock screening at its best. The simplest option when using stock screening is to run the screen on the health check dates without limiting the number of stocks. This is done by replacing the '5' stocks limit on the Settings tab with a '0' to see all passing stocks. If stocks in your current portfolio pass, no further action is required. Any stocks that do not pass should be sold and replaced with the highest ranked stocks that pass. The alternative is to add a rule on the Rules tab the identifies the list of stocks currently held. Click the Run Screen button and see if all your current holdings pass. If not, you must still go to the Settings tab and set for all stocks to look for the highest ranked replacement. This is more work but your choice. In any case, during the portfolio health check, do not sell a stock because of ranking. If you have access to the integrated portfolio, the buy rules, description, sell rules (aka health check) and portfolio management are all included. Much easier than the stock screening approach. For KISS 101, the portfolio buy rules are the same as the screener. The sell rule is used both for the health check and the refresh. However, for refresh, an additional criteria (Rank < 100) will force all positions to the 5 top-ranked companies. This additional criteria cannot be used during the health check. In addition to portfolio holdings, the equity curve of the strategy is estimated. Even better, when sufficient data is available, the risk factors for the strategy are calculated. The initial investment is set to US $100,000 to better track the equal value positions held in FolioInvesting. To run this strategy once it is set up in the integrated portfolio manager, all that is necessary is turning one sell criteria on or off depending on whether a refresh or a health check is required. Setting up MorningStar stock screening is straight-forward. Begin by selecting the S&P 500 universe. OOPS - not possible. However, it is possible to specify a quality universe using only stocks with either a narrow or wide economic moat. For more info on moats, click here. To further enhance quality, a proprietary rating of 3 or more stars is specified. This is one of the strong points of the product - the extra value MorningStar analysts add to the fundamental company data. Then choose the Consumer Defensive sector (the Reuters version of the sector is used). To complete the screen, force the dividend yield to be greater than 0 and the pay ratio to be less than 100. When done, save the screen by name. And save a description of WHAT you are doing and WHEN. Notice as you enter criteria, the number of passing stocks is updated. About the same number of passing stocks as StockRover and Portfolio123. Sort the passing companies by dividend yield and select the top 5. Save the top 5 to a portfolio. Since MorningStar cannot screen the portfolio, the health check is handled like the health check in StockRover Basic. Run the screen and confirm that stocks in your account still pass the screen. If you need to replace one or more holdings, select the highest ranked stock(s) you do not already own. This is one of the strongest portfolio managers available. Not because you can create a custom view of the data that interests you (you can), but because you can also get an email alert with any news coming out about the company. Great way to find out good or bad things (like dividend cuts) without hovering over some financial site on the internet. You can also get daily performance updates. Since the implementation depends heavily on MorningStar ratings, they are included in the custom view along with the financial health grade. The object has been to illustrate HOW to implement WHAT you are going to do with a strategy. In this case, KISS 101. With WHAT and HOW in place, it is time to invest.